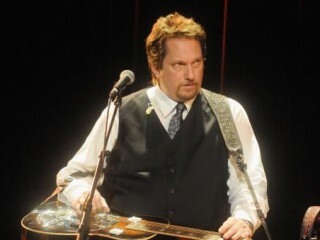 Jerry Douglas, born Gerald Calvin Douglas is an American record producer and resonator guitar player. Called "Dobro's matchless contemporary master," by The New York Times, and lauded as "my favorite musician" by John Fogerty, Douglas is one of the world’s most renowned Dobro players. Jerry Douglas started his musical career early. As a 5-year-old, he began playing the mandolin. He then moved to guitar and at 11 segued into Dobro after seeing Flatt & Scruggs Dobro master Uncle Josh Graves perform. At 18, Douglas hit the bluegrass festival circuit full time as a member of the Country Gentlemen. Before long, he joined Ricky Skaggs in J.D. Crowe's band, New South. In September 1975, the two young pickers broke away and formed their own group, Boone Creek. After three years, Skaggs embarked on his successful solo career, and Douglas started making his distinctive mark on all things Dobro. In 1983, Douglas joined the Whites and played with them for two years. During this time, he became one of the first artists signed to the MCA Master Series label, for which he recorded three solo albums. Douglas began recording for Sugar Hill in 1992. Following more than a decade on that label, he released The Best Kept Secret on Koch Records in 2005. He has won eight Grammy awards. View the full website biography of Jerry Douglas.